Sadly, Savers was pretty much free of any Pimptastic decorations, but we kept poking around, hoping to find a diamond in the rough. What we found was MUCH MUCH better than diamonds. 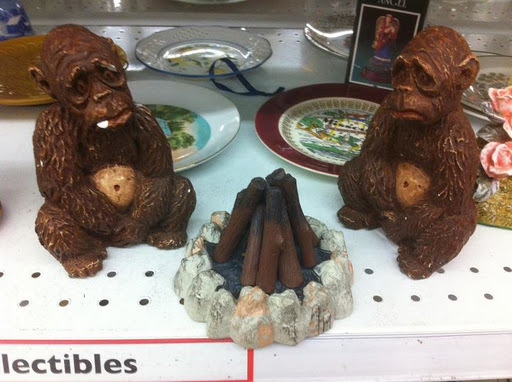 We found weird and scary monkeys sitting around a campfire. And supposedly, the campfire lights up (and hopefully makes a noise, too! fingers crossed!) El Jefe is in charge of making fire today. Please don’t let it be broken! PLEASE!!! I had to buy these guys. I can’t explain it. I think maybe I was scared not to. Or maybe I secretly hoped they were possessed by some evil serial killing monkey soul. I dunno. I just needed the monkeys and the campfire. So we started working on names last night. Ian was pushing for Boots and George but I nixed those names before he finished his sentence. I thought Carl and Gomez could work, but Ian was all NO. Fine. I’ll name them myself when you aren’t around. And so I have. Meet DC and Ike. Ike is the one on the left, who’s obviously been beaten up by his ex. DC is the host of Soul Train Tree and he always wishes you “Love, Peace, and Soul Bananas. This entry was posted in Uncategorized and tagged hot monkey love, must buys by Just Call Me Mel. Bookmark the permalink.